In this section you will find some frequently asked questions and answers to those questions. If you would like to ask us a question you can do so by clicking here. We do not have a physical retail store where we sell drapery hardware, but our headquarter offices are located at 3583 Palgrave Road in Mississauga Ontario, L5B1W1. We are also partnered with Prestige Decor Fabric & Window Treatments, a retail store selling window treatment products and services. If you require expert advice, or if you would like to see the drapery hardware products from our website in real life we suggest you visit Prestige Decor - Canada's leading window treatment experts. Are you Canadian-operated & owned? Yes, we are 100% Canadian-operated and owned. 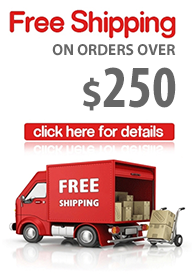 Drapery Curtain Rods Canada has teamed up with Canada's top curtain rod and drapery hardware suppliers to offer you the best selection of products at the lowest prices while offering discounted shipping Canada-wide. You can most regularly reach us by email at [email protected] as well as by our toll-free telephone number - 1-800-680-2905 from 10am-7pm EST Monday - Friday.